Click here to view a large-sized version of this picture. 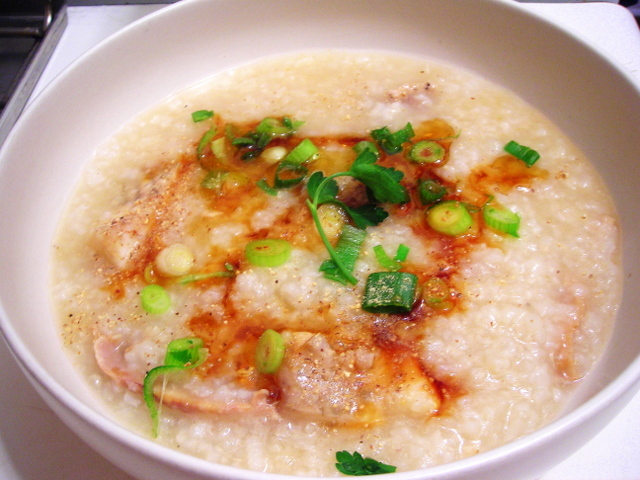 Otherwise known as jook, congee consists of rice and (either water or) stock that’s slowly simmered until the rice grains begin to break down. The result is a thick porridge that epitomizes Chinese comfort food at its very best. It’s perfect for a chilly autumn evening like tonight. There are as many recipes and variations of congee as there might be hairs on a donkey’s tail. This version contains flounder that was marinated in a mixture of sesame oil, rice wine and soy sauce, along with some leftover roast chicken from last week’s chicken dinner. The beauty of congee is that it can be a flavor vehicle for whatever toppings you happen to have on hand. These may include chopped deep-fried strips of dough, “hundred-year old” eggs, roasted peanuts, minced onion chives and nam yu (fermented tofu). Combine the soy sauce, sesame oil, white pepper and rice wine. Pour over fish cubes and set aside. Marinate for one hour. Meanwhile, prepare the congee. Combine rice and chicken stock. Bring to a boil. Add salt and sliced ginger. Turn heat to the lowest possible setting and cover. Cook for 1 1/2 to 2 hours. Remember to stir and check the consistency. If it becomes too thick, add some water. The congee is done when it reaches the consistency of pancake batter. Once you have achieved the desired consistency, add fish and leftover roast chicken to the pot. Cook for 15 to 20 minutes, covered. Serve congee in bowls, passing garnishes at the table. Leftovers can be frozen; keeps up to 6 months in the freezer. (1) — Essentially chicken stock infused with ginger, garlic and star anise. Water is fine as a substitute. (2) — Mince 2 or 3 large shallots, then quickly fry them until golden brown. (3) — Gomashio is a 5:1 mixture of toasted sesame seeds and salt. Used to season rice in the same way as furikake. (4) — Nam yu is fermented tofu. Available at some Asian markets. 14 Oct	This entry was published on October 14, 2009 at 6:34 am. It’s filed under autumn, Chinese food, food and tagged comfort food, cooking, dinner, food, leftovers, recipe. Bookmark the permalink. Follow any comments here with the RSS feed for this post. what a fantastic looking congee! Thanks for stopping by my blog! I’ve never heard of congee….sounds tasty. I’ll have to look into it further. Your blog is very nicely done & the photography is beautiful. Your roasting tomatoes post is very helpful to me. I’m one of those that is scared of “fresh” tomatoes. I love them sun-dried, in sauces, in salsa, in ketchup. I am scared of mush and seeds!! Just discovered I do like the grape tomatoes when cut and seeded. I am convinced I will learn more about them and discover ways of preparing them that I will like. I guess I’ve only tasted GMO & pesticide laden in the past. Any tips for one new to working with fresh tomatoes? Roasted tomatoes is on the menu for tonight’s dinner actually (but in a new form). One suggestion to avoid “mush” is to get tomatoes that are just about on the edge of ripeness and use those. Will be a little firmer than usual but the texture shouldn’t be too off-putting. Hope that helps, and thanks for stopping by. I’ve only just recently learned the joy of congee. Yummy! Congee is a fairly frequent menu item. It took me a while to get the proportions right. 1 cup of rice to 9 or 10 cups of water or stock is about right. Less liquid usually results in a more solidified congee, not quite the result I’m looking for. Thanks for stopping by Patti.